The long awaited University Motors Summer Party Reunion was held August 17 – August 19, 2012. John Twist, along with his staff, did a great job in organizing this first Summer Party since 2007. It was great to renew old acquaintances and see so many MGs as the photos here show. So why would anyone go and buy a 33 year old car without seeing it in person? On top of that, the individual already had a car of the same type and color and 12 years newer. I could have been accused of the old saying, “when they gave out heads, I thought they said beds and asked for a soft one”. It all started late in 1976 when I tried to order a TR6, but much to my chagrin at the time, these cars were no longer being made. My father at the time was a pilot for TWA and I was able to order a car overseas and save between 15 and 20 per cent of the cost, with additional savings on shipping. 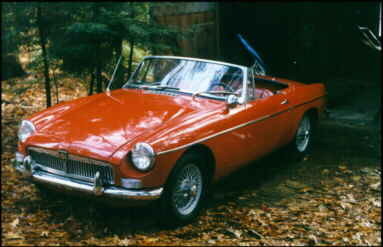 When they told me production had stopped on the TR6, I decided to keep it British and go for the MGB. I picked up the car in January of 1977 and have been driving it ever since. Throughout all the years of driving the ’77, the only thing I wished British Leyland had not done is go to the rubber bumpers in 1975. I like chrome. And it I ever got one, I would definitely get it insured with Aviva. In the fall of 1998 I attended (for the first time ever for an event like this) the “British Invasion” held the third weekend in September. The event takes over the town of Stowe, Vermont. There in front of my eyes were many, many MGB’s with beautiful chrome bumpers. Yes, that started me thinking. When I got back from the show, a neighbor, knowing that I needed a part for my 77, offered me a shell for a ’65if I wanted it for nothing. All I had to do was to go and get it off his land. When I saw it, I noticed the car was only good for parts but with it, came a factory optional hardtop in very good condition but not in a good color. Since I already had a top for the 77, I knew this was fate and went on line searching. At this point, my wife was seemingly behind the whole idea. I could not find a “B” on the net to my liking so I put an ad out there myself in the beginning of October 1998. I received about 5 replies. The first one came from a fellow down in New Mexico with just the one I was looking for. The first line of his note said, “I know this is probably too far for you but …”, my reply to him agreed that it was a little too far but thanked him for his time and effort to contact me. A few days went by and I could not get it off my mind because there was no rust on the car and it had been in the same family since its purchase in 1965. So, what did I do? Of course, I contacted him again and asked if he could send me some photos of the car. He said, “better than that, how about if I make a video of the car and send it to you?” What a great idea! Now of course, about this time, my wife started to figure I was getting serious and decided to try to bring me back down to Earth by asking, “how can you justify us having two MGB’s?” My reply was quick, “Linda, the first is hard to justify, the second one is easy”. The video came in about 7 days. Our 16 year old son was at home when I viewed it. The car was in really good shape with a lot of potential for the future. Of course the sobering words of my wife kept coming back to me. When she arrived home, I told her to at least look at the video and then I would send it back to the owner in New Mexico. After looking at the video for only 15 seconds she said excitedly, “You did tell the guy we are going to buy it, right?” Within a minute, I was on the phone sealing the deal. Now to get the car back to Massachusetts. I looked into having it shipped but because the car had not been run in about 8 years, it would have been much more expensive, approximately $1100. So, being of Scottish descent and therefore basically “thrifty”, I said why not, I will go down there myself and pick it up, put it on a trailer I would soon borrow from a friend and haul it behind my 1994 Ford Explorer. I left on a Friday morning in early November, made it to New Mexico on Sunday night and started back for home on Monday morning. This included a big detour in Illinois to visit some friends that I had not seen in years. On the way back, I stopped to see my brother and his family in Kentucky for a day. For the trip, I set the back of the Explorer up with some pads, a sleeping bag and pillows, deciding to sleep in rest areas along the way when I got tired. I usually drove until 1 or 2 in the morning and slept for a few hours. I made it back to Massachusetts on late Thursday night, so I was gone on the whole trip for just less than a week. Of yes, and of course 4500 miles and no breakdowns (I knew there was an MG god looking over me). I put the car away for the winter, changing the coolant and put some “marvel” oil in the cylinders. In June, deciding I had some extra cash, I said to my friend, Steve Curtin who owns a service station, “let’s see if we can get this thing going”. He called me at work a couple of hours later and said, “listen to this”, and in the background was the unmistakable sound of the MG engine purring. After eight years of being stored in a garage in New Mexico, all my friend had to do was drain the gas tank. Drain the bowls on the carbs, drop in some new spark plugs, fill up the tank with new gas, hook up a new battery and it started right up. Yes, all this in just under two hours. I have to admit, I was expecting maybe something a little more. But who is complaining? Eventually we had to put a new exhaust system in place as well a new top but that has been it. I have driven it for about 2500 miles and have had a ball. I have to admit I have been caught talking to my 77 saying that I was not ignoring it and hat I still liked it just as much as before. Now after all that has happened and someone asks me if I would do it all over again I reply, “heck, yes, besides, I still have all the maps from AAA. I like chrome even more now.